Preheat oven to 350°. Cook manicotti shells according to package directions for al dente. Drain. In a large bowl, mix ricotta cheese, 1 cup mozzarella cheese, pumpkin, Parmesan cheese, egg yolks and nutmeg. Spoon into manicotti. Spread 1 cup spaghetti sauce into a greased 13x9-in. baking dish. Top with stuffed manicotti. Pour remaining spaghetti sauce over top; sprinkle with remaining mozzarella cheese. Bake, covered, 25-30 minutes or until cheese is melted. Yield: 7 servings. My family will love this! I have not made manicotti in years. Yum! 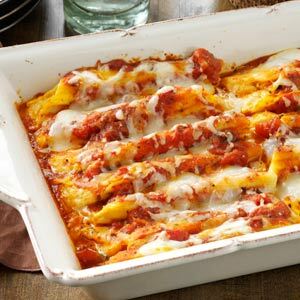 Thank you for sharing your healthy and delectable Cheese & Pumpkin-Filled Manicotti Recipe at the Healthy, Happy, Green and Natural Party Blog Hop. I'm Pinning and sharing!